The Inaugural broadcast of the Nikonian's On Location with your host Martin Joergensen. 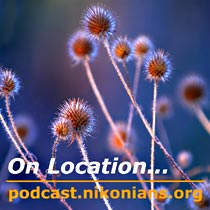 Click here to download Nikonians On Location Podcast #1 (NPC-OL-2007-12-30; 39:24; 36.1MB, MP3 format). Click here to view Nikonians On Location Video Supplement #1 (NPC-OL-2007-12-30; 6:46; flash format). Questions, Comments, Announcements? Email Martin at onlocation@nikonians.org, or drop us a line in the Podcast Feedback forum!